My April Birchbox is here! The theme for this month is "Tiny Tweaks, Big Results." We all know that if you look good, you feel good, but the problem is that not all products work for you, and even if they did, you might not be going about your daily beauty routine properly. So, for the month of April, Birchbox has teamed up with Womens Health magazine to bring us samples that will help us make "tiny tweaks" in our daily beauty routines to get "big results." 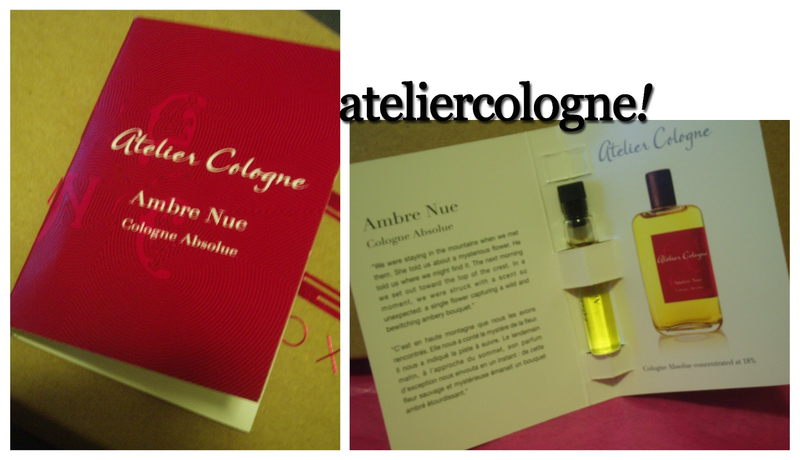 This is the Ambre Nue fragrance from Atelier Cologne. I was super excited to see this because I absolutely adore Atelier Cologne! The scents that they have stand out. The Ambre Nue is no different. I love earthy tones like myrrh and sandalwood, and this product incorporates both with floral notes to create a bouquet that is just love at first smell. If youre a fan of musk like me, this fragrance should be at the top of your list! Fragrance is a good way to change up your beauty routine; when you have wonderful scents wafting off of you, you not only put yourself in a good mood, but the people around you as well. This is the Mesolift serum from Lierac Paris. My first thought when I saw this was, "The packaging contains not a single lick of English; how fancy." I dont speak French, so needless to say, I had no idea what this product actually was besides being a serum. After a little bit of research, I learned that this product packs a triple punch: it hydrates skin, shrinks pores, and fights off wrinkles. On paper, this sounded like the perfect serum, but after trying it out, Im not too big of a fan. 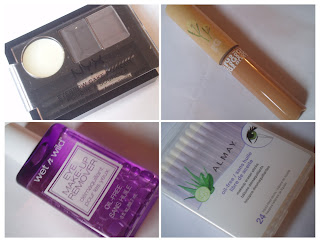 It takes a lot of product to cover my whole face, which is never a good sign. I dont know the extent of its claims yet; it might work really well, but besides the citrus scent of blood orange, I dont see myself liking this product. Serum is an important part of anyones facial routine because it does all the things that a simple moisturizer wouldnt be able to do. This is the Blow Dry Lotion from Number 4. Ive previously sampled the Clarifying Shampoo from this brand through my December Birchbox, and I was relatively surprised by its effectiveness. However, this does set up higher expectations for the Blow Dry Lotion. Its unique, though; Im used to heat protectants being mists that you spray on your hair, but this is apparently a lotion. I havent tried it yet, but Im excited to because this is not just a heat protectant, but a smoothing treatment as well. I dont know about you, but I love my hair, and I love taking care of it. Whatever the climate you live in, the elements can be harsh on your hair, so adding in an extra step in your hair care routine can do wonders. This is the Color Changing nail polish in Peony from Ruby Wing. I was super excited to receive this product because Ive heard so much about color changing nail polish, and Ive been wanting to try it out for myself. Color changing nail polish is the latest innovation in nail polish. Basically, your nail polish will be a different shade when youre outdoors. Peony is a peach shade that will supposedly turn bright red in the sun. Nail polish is an easy way to look polished (pun intended) without doing too much. Although, that being said, chipped nail polish is always a no-no. This is the Revitalizing Eye Roll-on from Simple. This product is one of those that I was excited about. Simple is one of my favorite drugstore brands because it boasts natural ingredients, and it is super gentle on skin, which makes it perfect for everyday wear. Ive previously tried the Soothing Eye Balm, which I really loved, and this product is ten times better because it is a roll-on, which minimizes the use of your fingers on the sensitive eye area. This roll-on is super soothing and cooling, especially after heavy use of makeup remover. Wrinkles and crows feet can start in your early 20s, so regularly using eye cream is the best way to combat that. 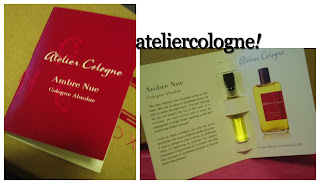 The 200ml version of the Atelier Cologne Ambre Nue Cologne Absolue can be bought for $136 on EBay.com. The 1.1oz version of the Lierac Paris Concentre Mesolift Toning Radiance Serum can be bought for $48 on LovelySkin.com. The 150ml version of the Number 4 Blow Dry Lotion can be bought for $32 on Birchbox.com. The 15ml version of the Ruby Wing Color Changing Nail Polish in Peony can be bought for $10 on Birchbox.com. The 0.5floz version of the Simple Revitalizing Eye Roll-on can be bought for $8.74 on EBay.com. 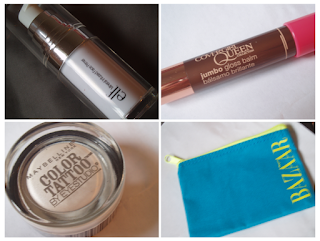 I love this months Birchbox because the samples are products that I would actually use. I will be writing separate reviews for the products that I havent gotten around to trying yet, so please check back if youre interested. If you do, include your link in the Comments section, and I'll check it out! I finally got around to trying the MAKE SPF30 Face Primer. My usual face primer is the Velvet Skin Coat by DHC. The product dispenses as a white cream that looks like moisturizer. It applies like moisturizer as well, and application is very smooth. A little goes a long way too. There isnt an obvious difference between this face primer and the one that Im currently using. It is more lightweight, and it feels more moisturizing on the skin, but thats pretty much it. There isnt a huge difference between their abilities to keep makeup on. The only leg up that MAKE has over DHC is that this face primer has SPF30. The MAKE SPF30 Face Primer may be easy to apply, and it may have slightly moisturizing properties, but I wouldnt spend the $30 simply to switch from DHC. However, once its time for me to get a new face primer, MAKE will be my first choice. Have you tried the MAKE SPF30 Face Primer? I want to hear your thoughts in the Comments section below! This is a long overdue post about our final day in Chicago. It was a more relaxed day because we had already done all that we wanted to do in the past three days. The only thing that we had to check off the list before heading back to Iowa was to grab pizza at Pizzeria Uno. Even before we left for Chicago, Justin made us promise that we will go to Pizzeria Uno while we were in Chicago. Since we heard that the wait is ridiculous, we decided to put it off because we didnt want to waste precious time. Why did we make such a big deal out of pizza? It is no ordinary pizza. At Pizzeria Uno, you can find the original Chicago style deep dish pizza. We ordered a pepperoni, sausage, and chicken pizza, I believe. As you can see, it is not only big but deep as well and loaded with toppings. One slice and youre done, trust me. 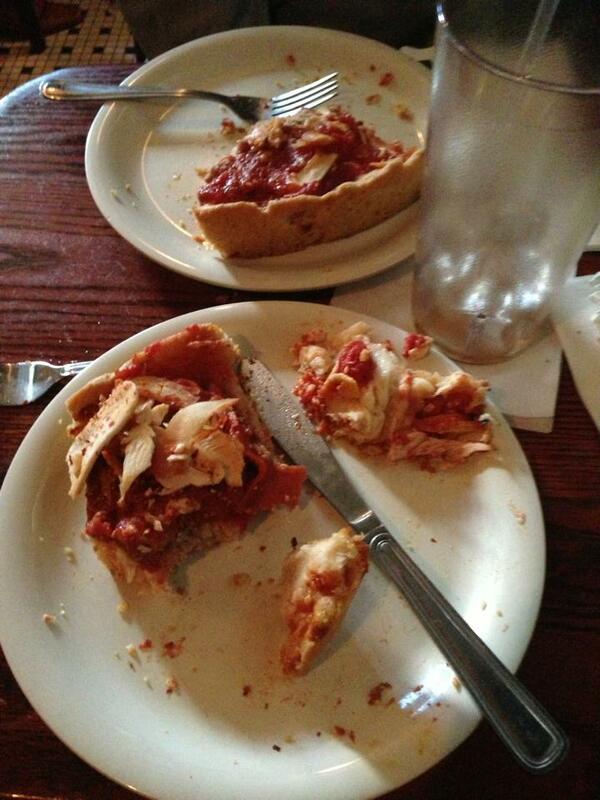 I couldnt even finish my slice. It was an amazing end to an amazing trip.